There is a storm waging on the internet, and at the center of that storm is one Grandpa Joe. A select number of people on the internet are trying to get us all to Say No To Grandpa Joe. Just hear them out. The whole thing started on the blog Say No To Grandpa Joe. Their mission: "expose the dark underbelly of the story. To reveal once and for all the truth about the only real villain in the movie (and no, it is not Slugworth). 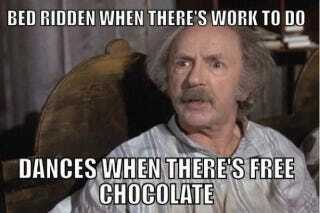 It is Grandpa Joe." And the facts line up. Grandpa Joe squirrels away money from his impoverished family for tobacco, spends his days in bed (but can walk for many hours upon hours) and more. The blog turned into a facebook page "I Hate Grandpa Joe From Willy Wonka And The Chocolate Factory." These vocal folks believe that Grandpa Joe is a monster, and that the record should reflect this upon the next iteration of Charlie and the Chocolate Factory.